The MYC office will be open this Sunday from 1-5PM while we are doing auditions. All tour wardrobe samples, including T-shirts, are now available to try on and you are STRONGLY encouraged to stop by the office to check sizing before placing your order (which is due one week from TODAY!). We will also be open next week from 9-5pm Monday through Wednesday, and 9-4pm on Thursday. (Closing early on Thursday to set up for required parent/singer meeting at Covenant Presbyterian Church at 5pm). If possible, please make an effort to stop in before the Thursday meeting as it will be quite congested if everyone waits until Thursday evening to try on samples. Thanks! Hemming help needed. If you get excited about neat and tidy stitches all in a row (you know who you are), and have some extra time to devote to The Great Hemming Project of Summer 2016, please contact Alyssa. Your help is greatly appreciated! Please see information detailed below (previously sent) as a reminder of upcoming deadlines and our meeting/rehearsal schedule next week! We leave in 55 days! Thursday, June 9, is the required parent/singer meeting at Covenant Presbyterian Church, from 5-6pm. Please make sure at least one parent is in attendance. Singers will attend this meeting with their parent(s) then proceed to rehearsal (also required) which will end at 8:30pm. Thank you for prioritizing this meeting. We promise it will be helpful and informative. These items are included in your tour price and participants will be asked to wear these pieces on specific days during the tour. Packets were distributed at rehearsal last week and the documents are due by Friday, June 10. Please do not delay in getting started on these forms--especially the Consent for Minor Child to Travel form as it requires the notarized signature of both birth (or adoptive) legal parents/guardians. Please check in with your singer to make sure the packet arrived home. We will have a bin at the parent meeting on June 9 to collect completed forms for your convenience. Several parents have generously volunteered to bring their notary seals to our June 9 parent/singer meeting and will be happy to notarize your Consent for Minor to Travel form that evening. Please remember that both parents must sign the consent form in the presence of a notary (separate forms may be used). 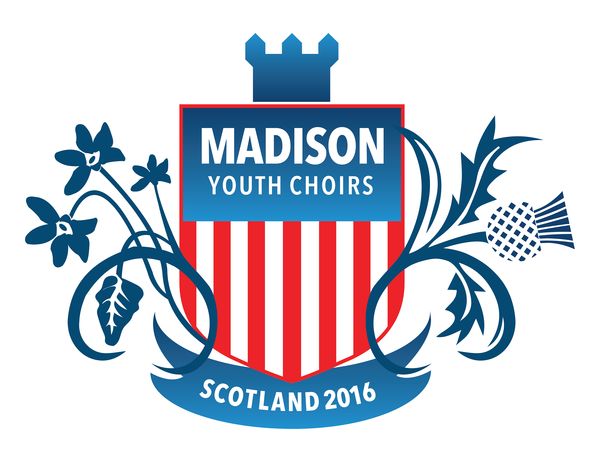 We would love to have a sea of red polos singing the National Anthem at the Mallards game on Wednesday, June 29 as we will be announcing the Scotland trip during their introduction. Click on the links below for all the information. MYC Night at the Duck Pond: Read this first! SignUp Genius - let us know you're planning to sing the National Anthem!